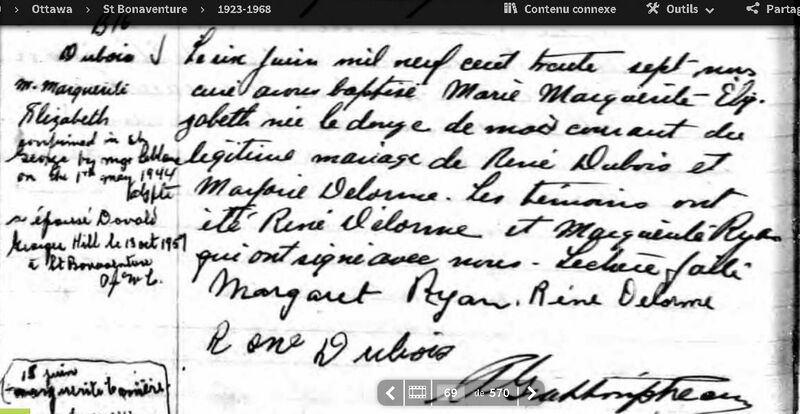 Je cherche le mariage de René Dubois et Marjorie Delorme. Leur fille Margaret Elisabeth épouse Donald George Hill le 13-10-1957 à Ottawa, paroisse St-Bonaventure. Margaret Élisabeth est décédée le 4 novembre 2013 à l'âge de 76 ans (je possède l'avis de décès). Elle demeurait en Ontario. Les funérailles ont eu lieu à Richmond, Ont. Elle avait 2 soeurs: Patricia (mariée à Lorne Vincent Meagher) et Jacqueline (mariée à Réginald Dumais). Merci de votre collaboration. HILL, Margaret Elizabeth ""Betty"" (nee Dubois) LLB (Former Reeve of Richmond, Mayor of Goulbourn and Ottawa Carleton Regional Councillor) Peacefully, Monday, November 04, 2013 at the age of 76. Loving wife of Donald Hill. Cherished mother of Marjorie (Michael O'Connor), Patti (Bernie Fee), Donald (Karole) and Randy. Dear grandmother of Blake, Bridget, Alysa, Julie and Amilyn. Special great-grandmother of Sebastian and Jackson. Betty is survived by her sister Tricia Meagher and predeceased by her parents and her sister Jackie. Friends may pay respects at the Kelly Funeral Home, Kanata Chapel 580 Eagleson road, Kanata On. K2M 1H4 613-591-6580 www.kellyfh.ca Monday, November 11, 2013 from 3 to 5 p. m. and 7 to 9 p. m. Funeral, Tuesday, November 12, 2013 to St. Philips Catholic Church, 127 Burke Street, Richmond On. for Mass of Christian Funeral at 1 p. m. Interment will take place in the spring. In memoriam donations to Canadian Diabetes Association or the University of Ottawa Heart Institute are appreciated. Victoria Marie (Conn) Dubois was born May 24, 1923 in Ottawa, Ontario., and died January 17, 1998 in Perley and Rideau Veterans Health Centre, Ottawa, Ontario..She married Milton Joseph Archibald Armstrong on August 08, 1942, son of Archibald Armstrong and Anna Kennedy. Passed away peacefully at the Perley-Rideau Centre on January 17, 1998 at the age of 74. Widow of the late Milton Archibald Armstrong. Daughter of the late Pascal Dubois and Marguerite Bellefeuille, Dearly beloved Mother of Kenneth (Marlene Fitzpatrick), John (Elaine Eng), Douglas (Jeannie Ng), Raymond (Lynn Lithgoe), and Janet (Chris) of Calgary. Devoted grandmother of Christopher (Julia Bryant) Hodson, Tara (Carlos) Hodson, Timothy (Julia Levesque) Armstrong, Nicole (Rob) De haan and Michael Armstrong. Cherished great-grandmother of Brittany and Christopher Hodson; Jordan and Shane Armstrong. Survived by sisters Clara McGowan, Dora Lanouette and brother Lucien (Cecile)Dubois of Mascouche, Quebec. Predeceased by a daughter Anne Marie Hodson (Jim), sisters Beatrice Lirette, Florence Albert, Florida Paquette and brothers Ovide, Rene, Clifford and Omer. She fought a valiant battle during the past year, and God has seen to reward her with a peaceful rest in the Kingdom of Heaven. She will be sadly missed by all of her family and friends. A very special thanks to Dr. Brown and the Ottawa-One West nursing and support staff at the Perley-Rideau. Friends may pay respects at the Kelly Funeral Home 2370 St. Joseph Blvd., Orleans from 2 to 4 and 7 to 9 p.m. Tuesday and Wednesday. Funeral Thursday to Divine Infant Church, Orleans for Mass of Christian Funeral at 11:45 a.m. Cremation Beechwood Crematorium. Interment will follow in the spring at Notre Dame Cemetery, Ottawa. In memoriam donations to the Perley-Rideau Veterans Health Centre appreciated. Buried Notre Dame Cemetery, Ottawa, Ontario; Section 40, Lot Number: 177. Burial: May 24, 1998, Notre Dame Cemetery, Ottawa, Ontario..
Milton Armstrong and Victoria Dubois, Ontario Registration Marriage Certificate Number: 7308, dated August 08, 1942, Carleton, Ontario. This is to Certify that on the 8th day of August a.d., 1942 at Carlington in the Province of Ontario, I solemnized the Marriage of Milton Armstrong and Victoria Dubois pursuant to due Proclamation of Intention to Intermarry. 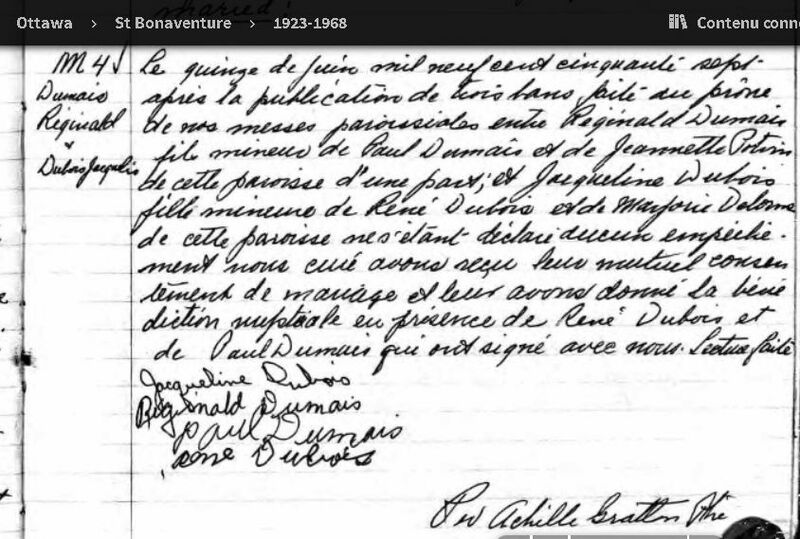 Witnesses to the Marriage are; Pascal Dubois (brides Father) and Leo Backs (Brother-in-Law to Milton and husband to Eileen Armstrong), signed by: Rev. Achille Gratton P.P., Carlington, Ontario, R.C. Un grand merci pour ces précieuses informations qui vont me permettre d'enrichir ma banque de données. Merci à M. Cantin pour ces informations fort intéressantes.